For the fans who packed the Coliseum the big event of their week-end celebration of the Bicentennial Fourt of July was Elvis coming home in concert. When he strolled on stage, the flash bulbs in the audience turned the scene into a pyrotechnic display with rivaled the fireworksshow on the riverfront Sunday night. "Let me tell you," he told the whooping sell-out crowd, "I'll sing all the songs you want. It's the end of our tour and I have as much time as you want tonight." The show featured the best of two worlds - the flashy professional Hot Hilton Horns orchestra from the Las Vegas Hilton Hotel and the gospel singing Stamps Quartet. They brought the house down with a driving version of "When The Saints Go Marching In"
Elvis kept his promise, singing steadily from 10 p.m until 40 minutes before midnight. The six songs from his long career began with the first recording he did in Memphis, "That's All Right." "They say I shouldn't sing "That's All Right" any more," he said picking up his guitar, "but by God watch me". His swivel hips brought sreams and his glance moans. "It never ceases to amaze me,"
he said, waiting for the waves of screams to die down. As he sang, fans shoved through the line of police to load the front edge of the stage with gifts for him - a toy soldier, a cake, a painting, a blue Chritsmas tree, a lei, pendants and personal letters. He kept wiping his brow with fresh scarfs and tossing them to the forest of hands reaching up to him. Relaxed and enjoying the show himself Elvis knelt and said one of the women jammed against the fron tof the stage "What do you want , honey? Just my scarf?" One song "Help Me" he said with a twinkle in his eye, was from an album he made two years ago titled "Elvis in the Gutter"
He was serious only once. Obviously irked by past reportson his health, he said "The last time I was here I was sick a couple of weeks. 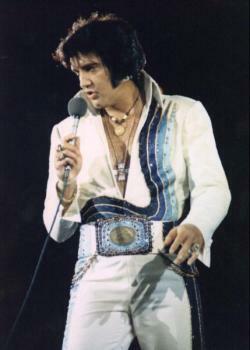 But I'm over all that and I'm working and I'm happy"
There was no doubt that Elvis' huge following is happy too. Two women were fighting over a scarf that Elvis had thrown. The woman in front was wearing a halter top ... the woman behind her did everything she could to pull her out of the way. Finally the woman in back grabbed the only thing she could get her hands on, the halter top. Off it came, but the woman in front had the scarf by this time. Obviously, she ran down the aisle without her top, holding the sacred scarf high over her head. That was the only time during the concert that my binoculars left Elvis and the stage. "It never ceases to amaze me!"